Crews work to cap a fire hydrant shooting water into the air in Santa Clara (Oct. 22, 2016). 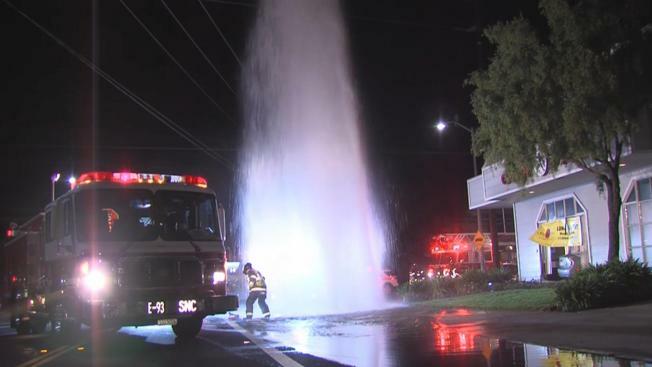 A car collision early Saturday in Santa Clara sent a powerful stream of water shooting several feet into the air. The crash occurred shortly after 1 a.m. when a driver plowed into a fire hydrant before eventually landing the vehicle inside Stuft Pizza located near the intersection of Homestead and Woodhams Roads, officials said. Firefighters spent roughly 30 minutes shutting off the water, officials said. The driver of the vehicle fled the scene on foot before being apprehended near his home several blocks away, officials said. No one was injured and the Santa Clara Police Department is currently investigating the crash, according to officials.